When I was a new mother, a more seasoned mom once warned me about the "Law of One Million", which says that if you do something for your kids once, like buying them a lollipop in the grocery store checkout line, they will then ask you to do the same thing about one million more times. Her point was think about what you do, because you may be doomed to repeat it (or at least be asked to). Apparently, the Law of One Million also applies to chickens. I think I have solved my chicken mystery (the little ladies not wanting to go into their coop at night). I, myself, created this particular monster. One night, it was not quite dark, but I had someplace to go so I wanted them to go in just a bit early. So I did the sensible thing (if you discount the Law of One Million), I bribed them with some cracked corn. Now, they have come to see cracked corn in the evening (as well as the morning) as their rightful due, and are refusing to come in unless I once again show them the goodies. They are as stubborn as a toddler holding their breath until they turn blue in the face, waiting out there in the absolute darkness for the corn that they are sure will come. I've had to introduce them to the concept of Tough Love. In other words, no more bedtime corn. Eventually, they got the point and they are done being persnickety (don't you just love that word? It's the kind of word my grandma would've used). And next time, I will remember the Law of One Million as it applies to avian brains. My husband had the wonderful idea of spending Christmas in a cabin. My sister and brother-in-law, and my mom also rented cabins in a snowy state park, and we had a very cozy Christmas together. We brought some games to play in the evenings, and on Christmas Eve we made felt ornaments together. In the morning, we unwrapped presents from each other, and then went on a hike at this amazing rock in the middle of the desert (I posted photos on my other blog). 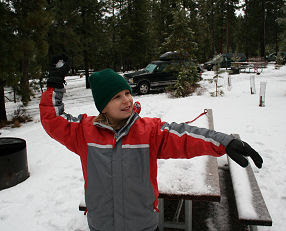 The kids played on the bunk beds in the cabin, threw snowballs and made snow angels outside, and we all had a fun time. I went into my favorite thrift store needing to find snow clothes for my biggest kid, the one who, it seems, grows about three inches a day. Nothing makes my day more than being able to find everything I need without ever having to walk into a mall! 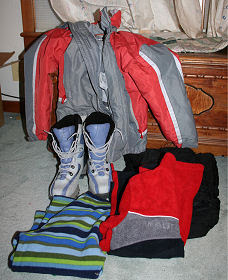 So check this out: Snow boots, an awesome jacket, ski bibs, and two fleece shirts, all for $27 - less than what one pair of boots would cost new. And all without anything new being added to the planet. So thriftiness and sustainability and the fun of finding a bargain all came together today. Today was simply beautiful. After a week of freezing weather, it warmed up just enough to feel quite comfortable, and the skies were sunny with big puffy clouds. I biked down to work this morning, and then this afternoon when the kids and I went to go meet our goat milk guy and pick up the milk, we decided to take the tandem/tagalong contraption. Our pickup spot is conveniently just off of the bike path that goes along the creek, so it's a nice ride and we saw lots of ducks, some heron, and nutria on the way. It is amazing though how much more complicated it is to bike with the kids. First of all, the weather's been so cold and wet that we haven't all biked together in a while. So there's the finding of gloves and helmets and jackets, and panniers, and getting all organized. Then biking with the kids is not terribly speedy, so it takes us half an hour or so to get there, and the same coming back. Something that would take 30 minutes total in a car ends up taking us almost 2 hours. It really makes me appreciate the total convenience that a car gives us to just jump up and go somewhere quickly. On the other hand, if we went in the car, we would've missed the sunshine, the smell of the grass, the herons and wildlife and the fun conversation along the way. I think one of my goals for the New Year will be a minimum of one car-free day a week. In the summer, we often go days or even a week or more without using the car, but it will be much more challenging in the winter months. Still, a good thing to pursue I think. And then on the days when we do run off somewhere in the car, we'll appreciate it all the more. I looked at my big half-gallon mason jar of goat's milk in the refrigerator this morning and contemplated all the ramifications of this one small choice we made in finding a local dairy to buy it from. 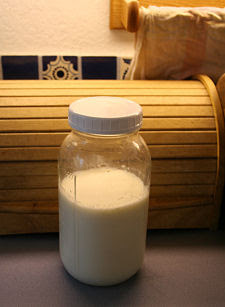 Previously, the only way we could buy goat's milk at the store was in one-quart cartons. That meant for every gallon of milk our family drank, four containers went into the recycling bin. Sure, recycling is better than throwing them away, but it still takes a non-negligible amount of resources to truck them to the recycling center and actually recycle them into something else. Now, we have mason jars that we return to the goat farmer to be re-used each time. This also means that somewhere in a factory, they do not need to make four more cartons every week and ship them to the large dairy (in gas-burning trucks on interstates) to be used. Somewhere there is a tree that won't be cut down this year to make our paper milk cartons. Somewhere, there is a truck that won't need to haul four more milk cartons from California to Oregon. There are gallons of fuel that won't be spent in simply getting my milk from the dairy to my home. There is a big homogenizing machine that won't be fired up to heat my milk up to high temperatures, thus killing all the beneficial antibodies in it as well as any harmful bacteria. Because my milk will come to me within a day of coming out of the goat, we can drink it raw. There is a local farmer who meets me face-to-face and takes my dollar bills directly from my hand. There is a person-to-person connection being made, and money being kept in our local economy. There is a goat farm somewhere that isn't being turned into a subdivision, a dairy that isn't being subsumed by a large conglomerate. There is land that isn't being turned into pavement and Chem-lawns. The implications of this one decision spiral outwards in myriad ways that I can't even imagine. My farmer is probably buying hay from a local hay farmer, or growing it himself. The CO2 emissions saved in every step of the long chain in this one small decision are undoubtably higher than I would even guess. Having recently seen An Inconvenient Truth, the repercussions of my decision do not seem trivial to me. My chickens are acting weird. They're laying eggs outdoors and refusing to come in at night, preferring to sit out in the freezing cold. I have checked the coop for pests, vermin, mites, and anything else I can think of. I changed all the bedding. What are they afraid of? What is going through their tiny avian brains? If anyone has ever experienced this phenomenon with chickens before, I'd love to know it. The guys at the Feed-n-Seed store (normally my source of fowl information) were mystified. It was cold enough last night to freeze the water in their coop, yet they stubbornly sat outside until I bribed them with some corn. I wish there was some handy web calculator for how much CO2 you're able to reduce by substituting a local alternative for your foods. I'm sure it's amazing! The cool part is that if you want you can have them come and dump whole trucks of leaves on your property. 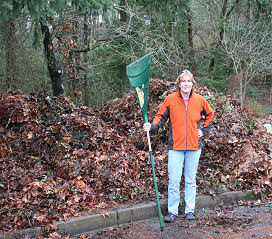 We've gotten about six truckloads delivered so far, and I think we will have plenty of leaves for mulching this year! I'm hoping that maybe if we spread them over the areas we've been trying to pull the oh-so-invasive ivy out of that maybe it will help keep it from sprouting back up in the spring. I didn't get around to planting a cover crop early enough this fall, so we're going to mulch the garden beds pretty heavily too. I've also used the leaves successfully in my perennial beds out front to keep the spring weeds at bay. And the leaves that are leftover have rendered our regular leaf-dumping area into some of the most fertile crumbly soil on our whole property (which tends toward clay to start with). This summer, we're planning on putting in a deer fence and turning that into the corn patch. I know this doesn't sit well with everyone, but I sincerely wish that all theatres and public places on the face of the earth would ban cologne. I sat through our daughter's ballet performance last night with my nose itching, eyes watering, knowing that I'd suffer worsening symptoms including a massive headache if I didn't pop a Benadryl as soon as I got home. I know that people just love to smell all flowery or whatever, but for some of us, the ingredients in these scents are horrible allergens to be avoided at all costs. Unfortunately, in a tightly packed theatre, avoiding is almost impossible. Personally, I never understood the need to have people up to twenty feet away be able to smell you coming. I think what happens is that once people start wearing perfume, they stop smelling it. Therefore when they apply what must seem like a reasonable amount, it's overwhelming to the rest of us who don't wear any at all. Kind of like those stores that regular people can walk into, the ones with aisles of scented laundry detergent, another aisle of Glade scented air fresheners, and another aisle of aromatic candles and potpourri. To those of us who spend most of our lives avoiding these artificial fragrances, it's an almost gagging experience. I've got another performance to sit through tonight and I'd like to really be able to enjoy it. So I'm hoping for a nice bland-smelling person in front of me, not a bouquet of toxic ingredients. After one solid month of experiencing your basic American way of life (sitting too much, driving too much), my foot is finally feeling good enough to use a little bit. So I managed to run today for a short while. Even better, I can bike for transportation again. I biked to work tonight and realized how very much I have missed this. The streets that cyclists use are largely quiet and dark, and in our town have traffic modifications such as selective entry areas that keep them from being heavily used by cars As a funny side note, I kept ending up on these non-car-friendly streets when I was driving, because I'm more used to getting around town on a bike. They are very frustrating to car drivers, but I'm still glad they're there because they make biking around town so much easier! It's true that the American way of life is so bad for your body. I couldn't believe how much worse it felt to just be sitting all the time (my foot began to ache after even a short time standing.) After just a week of this, my back started hurting, I won't go into details but my entire digestive system changed its operating procedures, even my vision (which is normally great) started giving me headaches from staring and screens and books for so long. It's no wonder we are a nation of people popping pills for back pain, pills for stomach upset, pills for reflux and heartburn, using laxatives and hemorrhoid cream to cure all the ills of a sedentary lifestyle. It's hard to believe, but people willingly choose to live like this, choose to feel like this! The good news is that it doesn't take much to rid your body of all of these plagues. I'm not exercising at anything near the level I was before getting injured. 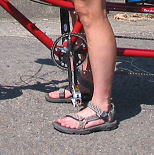 I still can't swim without using a floatie for my legs (I can't kick), and I can bicycle a bit, on flats and around town. I did manage to run one mile yesterday without foot pain, so I have hope for that as well. But just the minimal amount of movement I am now able to do has banished most of my sedentary symptoms. More than anything, I'm happy not to be dependent on a vehicle for even a short trip to the store. It was really eye-opening not to be able to even stroll down to the corner market, and made me appreciate the wonders of my body's basic abilities even more. I just finished reading this book and, as with all great non-fiction, am champing at the bit to discuss it with people I know. Of my friends in real life, they're all on the waiting list at the library for the book (I was too, but got too impatient to wait). So I'm going to have to pass my copy around and have more patience while they read it before we can talk about it. 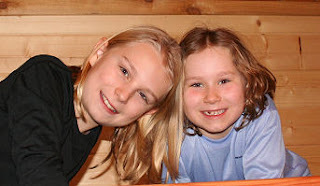 The Crunchy Unschoolers list promises to discuss in a week or two after everyone's finished reading. More than anything, reading this book has doubled my own personal conviction to make this a year in which to focus on developing local sources for as many of our foodstuffs as possible. The figures in the book describing how much of our nation's fuel consumption goes to transporting food around the country is definitely a big impetus to go even farther in changing our food buying habits. We already have eggs from the henhouse, and pork and beef from a local, very small, grass-pasturing farm. We can get goat's milk in season locally. I need to find a local source for raw cow's milk though, and make it a weekly commitment to get to the Farmer's market, as well as ordering a CSA box for next season. We're also hoping to expand our garden next year, adding a corn and cucumber plot up in the front of the house in addition to the raised beds in back. We can do more summer and fall gleaning as well. I found a good source for walnuts and hazelnuts this year, but we've already eaten most of the ones we got. Apples, blackberries, and pears are easy to find as well, so I need to get out my canning apron and go to town next fall. If anyone else out there is wondering how much difference there is between big centralized organic and small local farms, this book is a must-read!